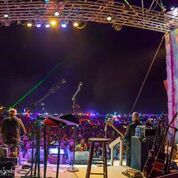 The Truth About Alan Parsons At Burning Man 2018! If you’re as big a fan of Classic Rock as I am, I’m sure that The Alan Parsons Project brings back great memories of amazing music from the `70’s & `80’s. That’s why I was both stunned and pleased to have seen them perform live at Burning Man 2018! My first exposure to Alan Parsons was his work as the recording engineer for Pink Floyd on the Dark Side Of the Moon LP, for which he received his 1st Grammy nomination. But, that wasn’t his first foray into the business. In October 1967, at the age of 18, Parsons went to work as an assistant engineer at Abbey Road Studios, where he earned his first credit on the Beatles LP, Abbey Road. He became a regular there, engineering many projects, including five albums by the Hollies. He was known for doing more than what would normally be considered a recording engineer’s duties. He considered himself to be a recording director, likening his contribution to recordings to what Stanley Kubrick contributed to film. This shows in his work with Al Stewart’s “Year Of The Cat”, where he added the saxophone part and transformed the original folk concept into the jazz-influenced ballad that put the song onto the charts. He produced three albums by Pilot, a Scottish band whose biggest hit was “Magic”. He also mixed both the debut and second LP for Ambrosia and was nominated for a Grammy Award for both. In 1975, he declined Pink Floyd’s invitation to come back after Dark Side to work on Wish You Were Here and instead started The Alan Parsons Project, with which he had multiple Top 40 hits and major album sales. In case you weren’t aware, this was my 20th consecutive time attending Burning Man and I’ve heard many a band of very varied styles/genres play there. I’ve also had the pleasure of sitting in on sax with a few of them. But, I had never before seen a major label artist perform there. 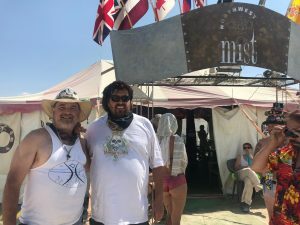 The Theme Camp I’m with, NorthWest Mist, was placed this year at 3:45 & Esplanade, the innermost street in Black Rock City. Offering a “misting tent” for relief from the desert heat, we always have lots of people coming in to cool off. I always like to inquire of people what Theme Camp they’re with and what they offer so I can plan visits accordingly. As the week progressed, I met numerous people from a camp called Reverbia, located about 200 yards up the block from us at 3:15 & Esplanade. 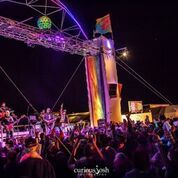 They feature live music all week on their concert sized stage and a large scale sound system. Every one of them asked if I was coming to see The Alan Parsons Project on Thursday night. My typical response was, “Yeah…right…sure…The Alan Parsons Project”…I really didn’t believe it was going to be the real thing. On Thursday night, I went up the block to see for myself. Lo and behold, it WAS The Alan Parsons Project! I recognized him instantly, having been a fan of his work for all these years and having seen him in concert back in the day. What a show! He opened with about 50 minutes of his hits, then, performed all of his album, I Robot. Fitting, as the theme for Burning Man 2018 was I Robot. He then played another 30 minutes or so with a couple of encores for an almost 2 hour show of spectacular music. 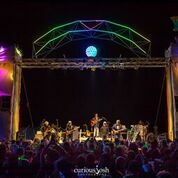 His band, consisting of him and 7 other world class musicians, each with world class voices, were solid as a rock and dressed in Burning Man “costuming”. Needless to say, it was the musical highlight of all the times I’ve gone to the event. I even got to meet him personally the next afternoon when I recognized him as he was riding by my camp on a bike and got him to come in for a “misting”. Photo courtesy of The Saxman! TELL US ON FACEBOOK IF YOU WERE THERE! EVER BEEN TO COMPRESSION OR DECOMPRESSION?